E-books and e-readers are big news. Amazon recently reported more e-book sales than paperback book sales. 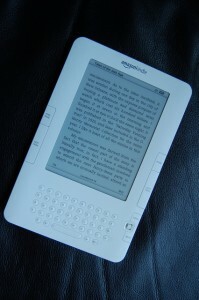 The 2011 Horizon report suggests e-books will be mainstream by the end of this year. E-reader prices have come down, they are more sophisticated, and there is a growing selection of e-books to buy, or even download (legally) for free. The day my Kindle arrived, I happily plugged it into my PC to charge up. While it was quietly purring away, I did a few Google searches to see if I could find out where to start. No way was I schlepping through the e-manual. Not finding exactly what I needed, I turned to my PLN on Twitter and Facebook, and solicited advice. It turned out that quite a few of my network already had Kindles. I was one of the last to be joining the party, it seemed. If you, like me, are arriving late to e-readers, read on. 1. Buy a cover. Although the Kindle is resistant, you probably don’t want your small children putting their jam- covered fingers over it when you leave it lying around. 2. Use the 3G or wifi connection to catch up on your RSS feeds while lying horizontal on the sofa. Not as heavy as an iPad (imagine that dropping on your face as you drift off), or as awkward as a netbook (ditto), I’ve found the Kindle perfect for catching up on blogs without being stuck in front of my computer screen. And e-ink is a lot easier on the eye than a back-lit computer screen. 3. Read work documents on your Kindle. PDF formats are compatible, but Word documents need to be converted to .mobi fomat for Kindle. You can use a free program like Calibre to manage all of your e-reader documents – see Miguel Guhlin´s blog post for more about this. 4. Use Instapaper on your PC to save webpages and documents for later reading on your Kindle (back to the sofa). 5. Use the annotation features to highlight and annotate texts. Although the Kindle navigation buttons can be a little clunky at first (what, no touch screen? ), you get used to them. All your highlights and comments are stored in one place, so you can skim read what you picked out as important in a text, in one go. Great for reminding yourself just what that book on differential mechanics was actually about. 6. Share snippets or notes from what you are reading via Twitter and Facebook (although presently not all countries allow connections via the Kindle 3G with these sites). 7. Add the free Kindle app to your smartphone and to your desktop/laptop computer. It will automatically sync with your ebooks, so when you stop reading a book on your Kindle, you can pick it up on your iPhone or PC exactly where you left off (and vice versa). Great for catching up on reading on your iPhone while in the post office queue, or waiting for a bus. 8. Download book samples before you buy. You can search the Amazon store for an e-book, and download a sample (usually a chapter or so) to read first. When you get to the end of the sample, you can simply click on a link to buy the book instantaneously. No more ordering the print copy online and waiting for ages for it to show up. 9. Stock up on free e-books. There are plenty out there, especially classics. To find them, try sites like this, or use a kindle search page to get good e-book deals. You can also lend or borrow e-books for free via sites like Lendlink, Lendle and Booklending. *Thanks especially to my colleagues Lindsay Clandfield, Ana d´Almeida and Bob Merckel for their helpful Kindle advice. You can see their comments in our Facebook discussion here. If you are an e-reader fan, please share any tips or tricks you have in the Comment below. I´m still a noob (10 days in) so have plenty to learn!